There are so many ways our 3" Gear Tie is useful. With a fully bendable wire interior and colourful, durable, soft rubber exterior, the Gear Tie is the perfect all around organizer. Keep computer cords, headphones and ear buds bundled and untangled, close produce and snack bags (the Gear Tie is perfect for goody bags!) shore up plant and flower stems and much, much more, all with a simple twist. This 48-inch PVC slat board track makes it a cinch to maximize and organize the wall storage space in any area of your home, including the laundry room, basement, garage or garden shed. What's more, because the tracks are lightweight and easy to install with the provided screws, customizing your storage space is easy as pie. Featuring an attractive white finish, this track is made from durable and easy-to-clean PVC. Gear Tie 3 Inch. 4-Pack Assortment There are so many ways our 3" Gear Tie is useful. 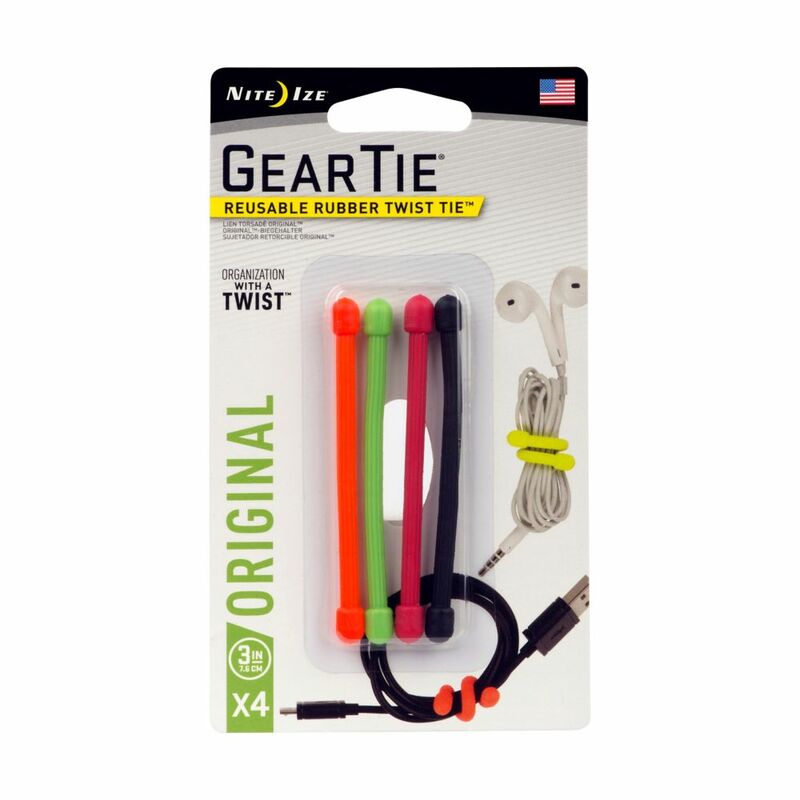 With a fully bendable wire interior and colourful, durable, soft rubber exterior, the Gear Tie is the perfect all around organizer. Keep computer cords, headphones and ear buds bundled and untangled, close produce and snack bags (the Gear Tie is perfect for goody bags!) shore up plant and flower stems and much, much more, all with a simple twist. Gear Tie 3 Inch. 4-Pack Assortment is rated 4.5 out of 5 by 15. Rated 5 out of 5 by Rich from I’m using these to help organize all my cords around... I’m using these to help organize all my cords around my computer. Rated 5 out of 5 by Daniel from Great little flexible, reuseable cable ties. Perfect for keeping any... Great little flexible, reuseable cable ties. Perfect for keeping any type of cables neat and tidy.Are use them for everything from iPhone cables to the are use them for everything from iPhone cables to guitar cables. Rated 1 out of 5 by Surelock from Twist ties Saved twist ties from Bread and such they work in the same way, Plus they're free!